My Pintrest my art is in a folder there. 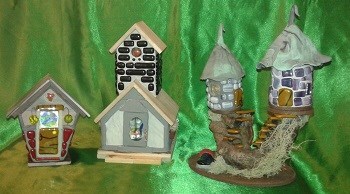 Here are some photos of things I've made. Gizmo the Clown second pic is Miss Gizmo his wife. 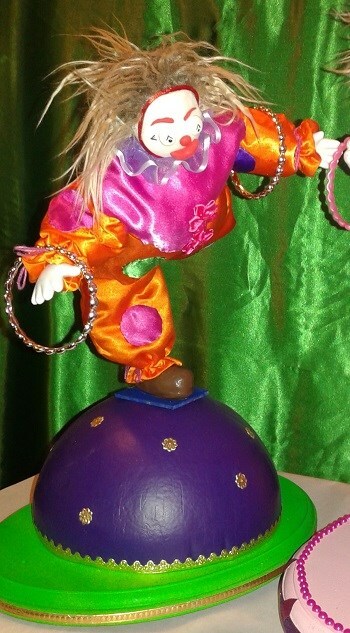 Miss Gizmo is a doll I promised I would make for a friend of mine who did this circus act. 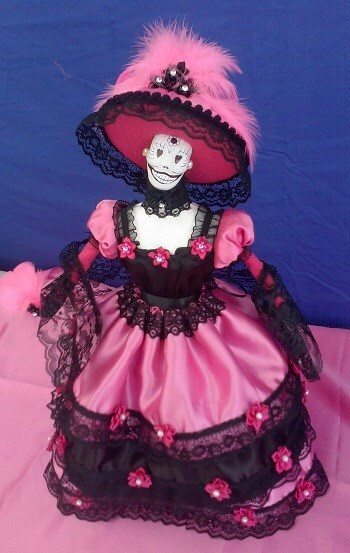 Day of the dead doll made for a friend in their favorite colors. I love her hat! Pretty much my 1st Dotee doll whimsy style. 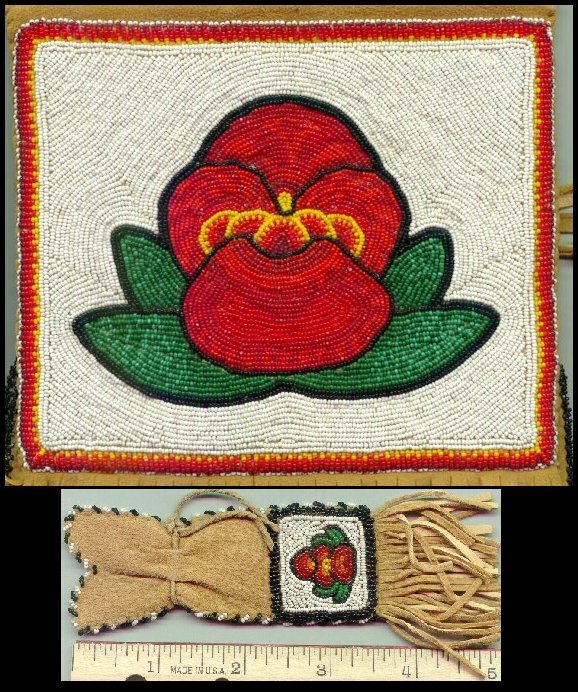 A set of beaded medicine bags full size and mini. The large bag got second place at the fair my older brother got 1st place and grand champion. A beaded wooden box, beaded bottle and large beaded crystal. This is my addition to public art. 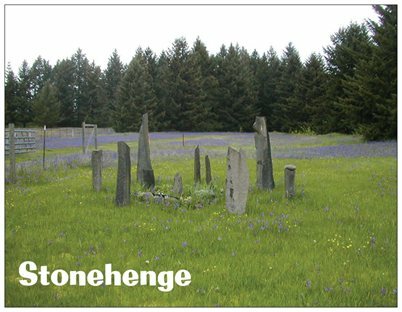 Stonehenge is on my property by the road so everyone can see it. Hello, My name is Andi and I joined swap-bot because my daughter is here @smadronia I know she enjoys it a lot and I love to send and receive mail so it sounded like a fun place to be apart of. This is the only profile I have filled out anywhere online. I'm am old hacker but not big on social sites. I make a good hermit. I'm in my real late 50s ooops time to update this I cant make this claim anymore. I'm an old hippy and I live out in the country with my cats. Its not too far from the big city but we can get stuck at home by flooding at times. We also tend to lose power several times a year. I say this just in case I'm late mailing something which I hope will not be the case. I'm one of those people who still has not stopped smoking cigarettes (yes I know I'm bad) and if you're a smoker or not I will make every effort to not send cat hair or items that smell like smoke. They might smell like fabreeze or dryer sheets however. It would depend on what was sent. Please don't condemn me because I smoke I know its a nasty evil habit. I'm working on it. 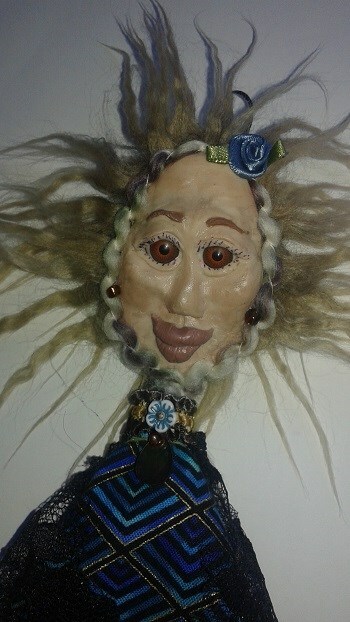 I come from a long line of artsy crafty folk and have had so many hobbies I've forgotten half of them. I love to make and create things and as I said at the start I love to send and get mail. As it says above my human child is already a member of swap-bot and lives in another state so sending me goodies for her is pointless. I love Stitch and toothless! 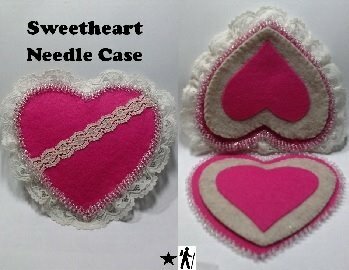 I do lots of different kinds of crafts and always loved handmade items. Store bought gifts are never as special as something a person made themselves. This fan belongs to @smadronia it was made by her uncle and beaded by me. I'll list the things I have been into most recently because if I put them all in here the list would be way too long. 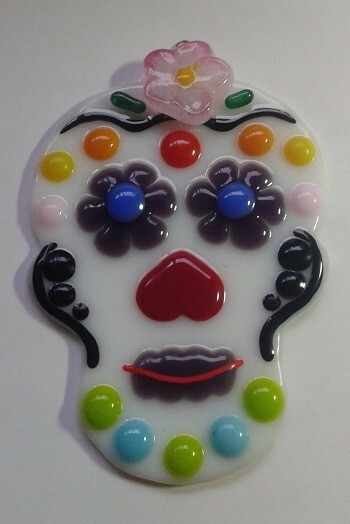 Glass beads and beadwork of all kinds. I started doing Indian beadwork when I was young I have started beading again but with larger beds than once upon a time. 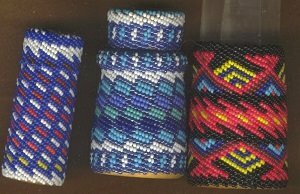 I have a big collection of seed beads and beadwork from around the world. Please don't send me mixed seed beads I have kilos already. Kiln formed glass. 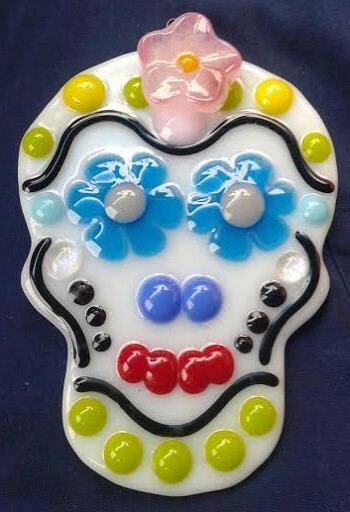 My daughter got me hooked on fusing glass. Anything with The Great Wave on it by Hokusai. I have a huge poster of it above my bed. Junk crafting making things with lost objects. Things that have to do with the stars and planets. In general any kind of stars are ok with me. I've had starhiker as an email addy for 20 some years stars have became my signature. Glow in the dark anything I'm old but I have stars painted on my bedroom ceiling. Maps any kind of maps. 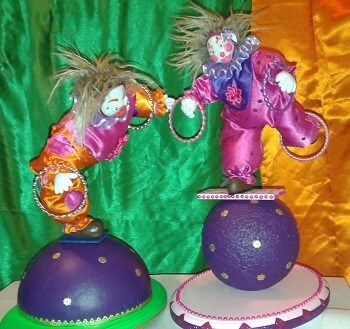 Circus and carnival things. Old gate tickets for any kind of event like this. Ride passes fair passes stubs from rodeos shows etc. ephemera of that nature. I like all kinds of old things maybe because I'm getting old I don't know. 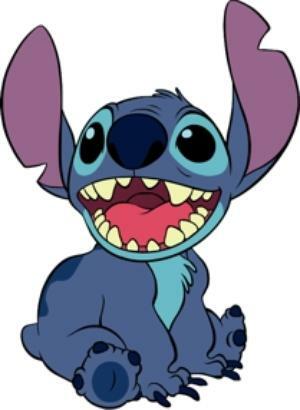 I love Stitch from Lilo & Stitch. I don't care about Lilo but have had Stitch as a traveling companion for a decade.He's got his own red spaceship and everything. If you get a typed note from me don't feel slighted be happy you can read it. If you get a hand written note from me I'm sorry my writing is crappy aren't you glad I print? I'm really not into pink, ruffles, cute, hello kitty, cutesy or kawaii. I'm more into elegant romantic antique and vintage things. I'm an old hippy so peace love and happiness work. Steampunk is cool off color is ok. I have my own entity to worship so please don't send me anything about your god. Please no loose sheets of memo, notebook, or plain paper. They quickly become cat toys or fire starters. If you wish to send a pad of paper, pretty printed heavy card stock, vintage or fancy paper that's fine. Stickers, I really don't use them to speak of anymore I send boring envies so folks don't steal em,. 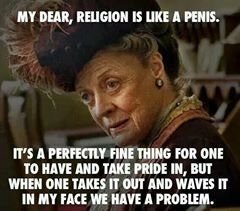 Nothing religious or Christian related please, I'm agnostic. Peace and love are fine but please keep whatever higher power you have to yourself. I really like cats better than dogs. I like old things glass beads, books, paper scrap. 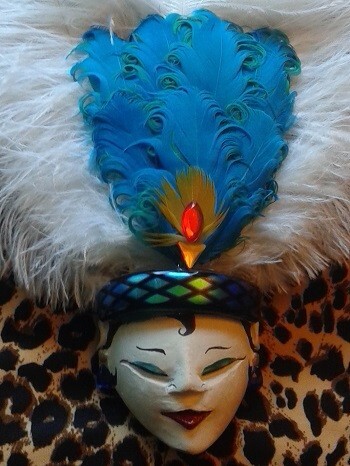 I'm indian so I'm not adverse to using animal hide, feathers and fur in my crafts. They make good cat toys too. I guess I'm a snob in that I don't use plastic much in crafting. I like natural stone and glass beads if I'm going to make something beaded. I use mostly tiny tiny seed beads for beadwork and I use larger beads to add to my fused glass and leatherwork. I have kilos of seed beads please don't send me any I have enough. 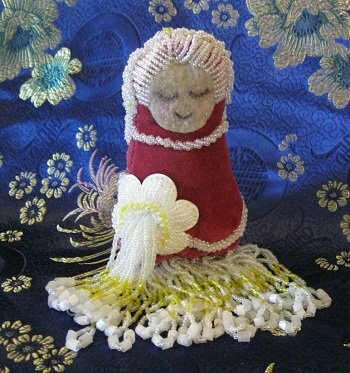 When I host a swap I will angel (which is a misnomer when applied to me I'm not a sweet old lady, I'm a plain spoken old lady) the person who didn't receive their item. You have to go thru the standard steps of rating the flaker a 1 and so forth first. There is no point in putting that info into each swap, it should be a given if a person host a swap. I have to say I think swap bot should have higher standards for swap hosts than swappers. I would think it's bad karma as a host to send late or not sign on and assign partners until the send date of a swap but now I've seen that happen. I assign partners the next day on swaps. 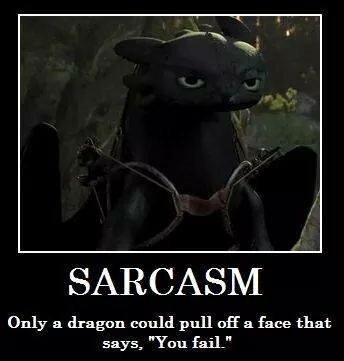 My envies tend to be plain so they don't get caught up in the sorting machinery. If one of the swaps I send gets lost let me know I'll send another one. As far as I know everything has I have sent has arrived. update 2/19/14 I think 1 was eaten by the postal gods on its way to Holland we'll see. Oh dear the postal gods are up to 2 swaps eaten now. As of 10/16 no other swaps have been lost in the mail. 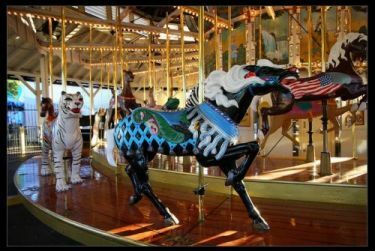 The photo above is my favorite carousel its in Oaks Park Portland Oregon. In 1947 my grandpa ran away and joined a carnival to sell food, although we no longer travel with a show we still sell food at the same fairs and events he did. I worked in an amusement park as a teenager and have many circus friends so all three of these themes tie together for me. Iâ€™m not a carny because I don't travel with a show but I am a showman. One of my ancestors founded a college this is the family motto. This translates to Untarnished, She Shines With Honor. Pretty good motto to live by I think. A million bucks (hey wishing is free ya know). Glass paperweights figurines or candlesticks. Old postcards of circuses or amusement parks. Anything about Stitch (from Lilo & Stitch). Odd shaped glass bottles to melt in my kiln. Tiny old perfume bottles or decanters, things like that. Mobiles. thats what I make with the tiny bottles. Big glass beads of any size but they have to be glass. I don't use plastic. Necklaces with large glass beads melt nicely in my kiln. Please no seed beads I already have more than I can use in a lifetime. pearl, shell or glass buttons. wooden nickel's smashed pennies. anything from any Worlds fair. silk scarves. I use old scarves to dress dolls. Cat toys for my kids. I doubt anyone will find this but a little 3 cup corningware teapot. Mine got broke and its easy to find larger ones but the 3 cup size is what I want. I have the larger size already. Never mind someone found me one Yippy. If I'm in your group and I'm not active enough, go ahead and drop me. Comment: Thank you so much for your lovely art work. The clip thingies that hold the hanger are genius. I'm going to have to order some for myself. ;D And the extras are most appreciated. Thank you! Response: The clip things are necklace bails and I figured the sample cards would cushion the art well. Response: Happy to hear you liked them! Response: With everything in your life I bet you don't get to color soon. The best part of the swap was meeting up to give it to you. Comment: I'm giving this rating because I don't want a stressful holiday. I never got my swap even though tracking said it was left on my porch. It's not your fault someone probably walked away with it & it's not fair of me to give a bad rating on something that was proven delivered. I just want to make it clear that I never received this swap. I was looking forward to getting it, but it is what it is. Enjoy your holidays all the same. Response: If it has been a postcard I would have resent but if I send another package and the thieves steal it off your porch again all I'm going is enriching them, I can't afford that. Comment: Love it all! I really thought my quite chubby cat would have no interest in the "tube" but he loves it even though only half his body fits in, he likes hiding in it (like right, your whole back end is out - lol!) The rest of his goodies went in his stocking. Love the little cat backpack - will use it when I go walk - I like small backpacks for that purpose. Have a lovely holiday and thanks again. Response: That's funny, I bought the toy before I knew he was so big but I'm glad he plays with it. Comment: Thank you for sharing your volting story. It's nice to learn how other states do thier polling. Response: It is interesting they vary so much. Comment: Thank you. Not sure why you posted a profile comment to rush this rating though -- it had only been a day. Response: Because it should be simple to do. Response: Thanks for rating it's so hard to get rated on type 1's. Comment: Thank you for your voting story. We also had two elections this year, so it was my second time voting as well. Response: Gotta vote if you want change. Comment: im right there with your mom. i say :it doesnt matter when and where you vote as long as your voting. thank you for voting. Response: Can't complain if you don't vote. Comment: Thanks for voting and letting me know how it went for you! Response: Thank you for voting too! Response: I miss the stickers they figure it saves a lot of $ though. Response: Thanks for the prompt rating! Comment: Thanks so much, awesome paintings! Response: I like abstracts, glad to hear you liked them! Comment: These are SO amazingly beautiful! Thank you so very much! Response: My Jackson Pollack phase. Glad you like them! Response: Thanks for rating quickly! Sandy ps - Scratt wants to be a Viking too! Hey stranger! I was thinking of you and hoping all is well. Just getting back to the bot and thought I'd pop by to say hi. Wishing you all the best in 2019! May your 2019 be better than 2018, and your best year yet! Love you Momma! Yes, I do make yummy chocolate things. You want some brownies for your birthday? Hey, thanks for the visit! I'm still alive, just been obsessing over my stamp collecting and gathering pictures to make some glue books. It seems the older I get, the worse my 'issues' get. ;oP I have absolutely no interest in swapping anymore, though I do miss the interaction with my s-b friends. I've had intentions of keeping in touch with you and a couple others, but I've gotten really bad at that too. Are you still at the same address? Things sure have changed here! Scratt sends his love. :o) PS - Did I tell you that I had to put Buffy down last July (she was 19)? I miss her so much! :o( I'll be in touch. :o) Hope you've been well! Whimsy1 I was the host of the swap and yes I noticed you sent late it is my business as host. For a week and a half there was a comment asking to be rated.You need to sign on swap-bot more than twice a month. Sending on time and rating promptly are 2 of the requirements of my swap.If you don't like swap requirements don't join. You told your partner you would be late because of your brothers schedule or something of that nature. Its it your mother or your brother slowing you down?